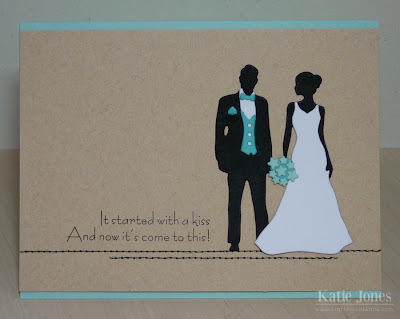 I couldn't resist the new Papertrey Ink Man & Wife Die Collection. Don't you just love this bride and groom? I made a simple card by first taking a 4" x 5 1/2" piece of kraft cardstock and machine stitching a couple of black lines near the bottom. I then adhered this to an A2 size aqua card base. Just a warning: some of these dies are TINY!!! They aren't the easiest to work with, but since this isn't the type of card I would need to mass produce, it's not too bad. 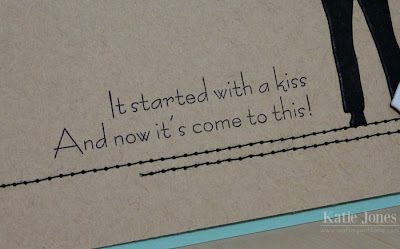 The sentiment is from Papertrey Ink's Just a Kiss mini stamp set. So cute! Katie ~ OMG!!! I LVOE this card!! 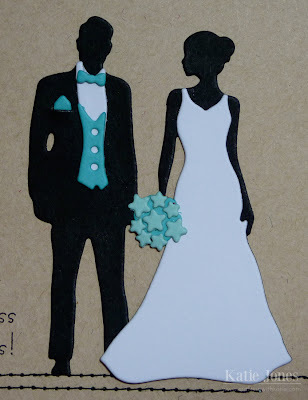 Those groom/bride dies are so FABULOUS!!! So CAS with the color choices too! The touch of stitching and the pop of the aqua and Hawaiian Shores paper is WOW a factor!!! ADORE it! So will the happy couple!! Again have a wonderful day!!! lovely card, and love the sentiment !!! Gorgeous!!! <3 it. Super elegant. Love the stitching. Beautiful card...Love the stitching for a standing spot. Great job! What an ELEGANT, BEAUTIFUL card!!! :) I love the aqua, too! It does look like you need a lot of patience to work with those dies, but it definitely was worth it!!!!!! !